What inspires you, captures your imagination, or just imbues beauty for you? The Gazette recently asked six Harvard professors to discuss their favorite objects, which included one of the earliest printed books, a three-dimensional model of a crystal, a hand-carved wooden bowl, and a plastic bag filled with sand. The varied items have deep personal and professional connections to these faculty members, and offer glimpses into their lives. Here are descriptions of their eclectic items and explanations of why they hold deep meaning. It’s happened to many of us. We pass an object for years without it registering. Then one day we stop and see it clearly for the first time. Its beauty, and its scars, captivated her. “I can still feel the touch of my grandfather’s hand on this wood and the way in which he delineated the contours of this body,” Giuliana Bruno said of her favorite object, a portrait painted by her grandfather, the artist and architect Luigi Bruno. She also loves its connection to the past. 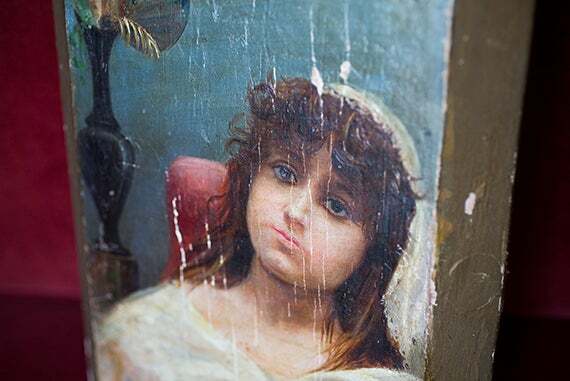 Bruno’s choice not to restore the painting’s scratches and cracks, even a perfectly round hole drilled by a termite into the young woman’s right eye, is intentional. Those small flaws tell their own stories, she said. 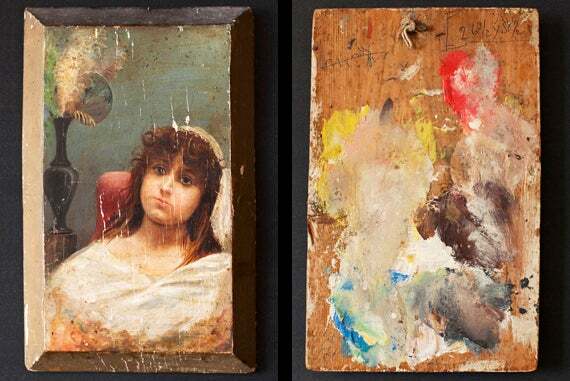 The reverse side of the portrait is covered in color and was likely used as a palette by Bruno’s grandfather. Something else speaks to how the painting once moved through the world: Its reverse side is covered in color, with red, yellow, and blue splashes of paint in what was once her grandfather’s working palette. 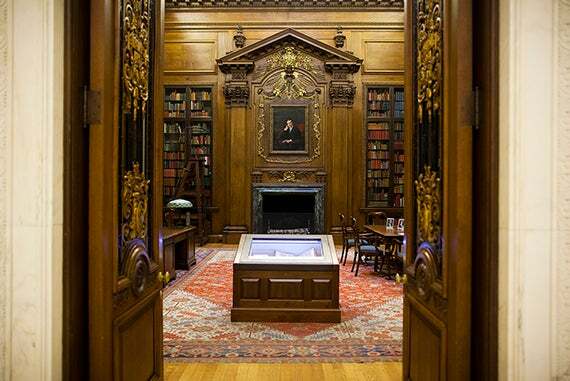 The Harry Elkins Widener Memorial Collection is a beloved part of Harvard’s Widener Library. One of the collection’s most famous books, and Ken Rogoff’s favorite object, is Johann Gutenberg’s 1454-55 Latin Bible. Economist Ken Rogoff likes to revisit one of the most famous items in the Harvard collection: Johann Gutenberg’s 1454–55 Latin Bible. The large, rare book is displayed under glass behind a velvet rope in the Widener Room, the space in the library of the same name dedicated to the memory of young Harvard graduate Harry Elkins Widener, who died during the sinking of the Titanic while returning from a book-buying trip to Europe. 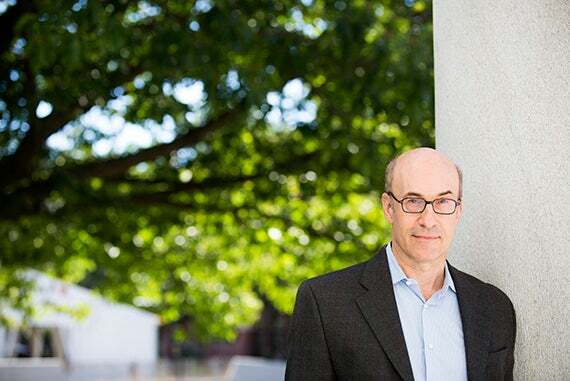 Ken Rogoff, Harvard’s Thomas D. Cabot Professor of Public Policy and professor of economics. Rogoff finds the volume so appealing in part because of how it opened the world to an exchange of information. 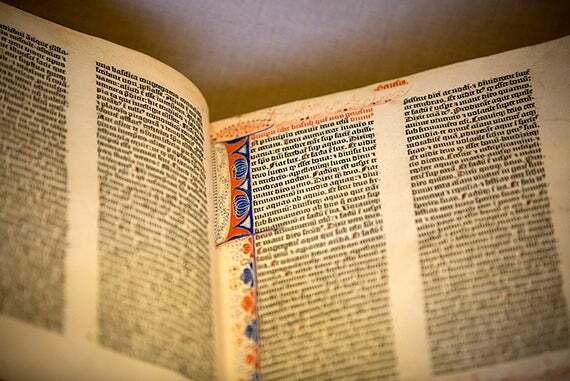 “The Gutenberg Bible represents one of the transformational periods in the modern era; it’s really like the Internet for the medieval period,” he said of the first major work printed in the West using movable metal type. He is also drawn to the book’s beauty, its vivid text, and its evocative, illuminated pages. “It’s surprising that they could produce something of such elegance and grace and grandeur so long ago,” Rogoff said. He first saw a copy as a freshman at his alma mater, Yale University, but he likely first heard about the Bible as a teen, he said, in connection with another one of his passions: chess. Among the earliest books ever printed was the Spanish chess player Luis Ramírez de Lucena’s 1497 chess book that helped to unify the rules of the game around the world, said Rogoff, who is also a chess grandmaster. “It’s surprising that they could produce something of such elegance and grace and grandeur so long ago,” said Rogoff of Harvard’s copy of Johann Gutenberg’s 1454-55 Latin Bible. And while Yale’s copy is beautiful, said Rogoff, the history of Harvard’s volume makes it even more special to him. 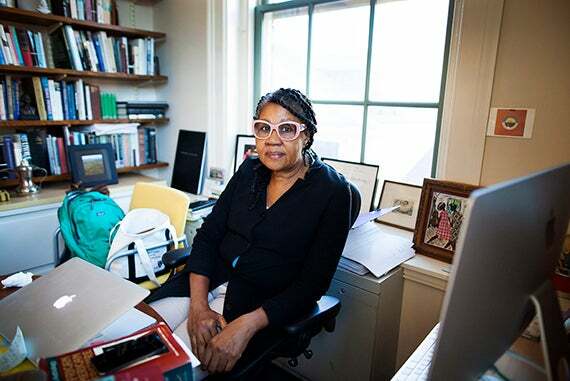 The favorite object of Harvard’s Jamaica Kincaid is a plastic bag filled with sand from the Mohave Desert. She thinks it might have been during her childhood, as she played on her native island of Antigua and imagined the landscape absent of azure water, as if she had pulled a giant plug and drained the Atlantic Ocean and the Caribbean Sea, that the vision of a desert first struck Jamaica Kincaid. Jamaica Kincaid, professor of African and African-American studies in residence. Today she finds a desert thrilling, with its desolate, stark beauty, and its harsh conditions that on rare occasions usher forth a rich plant life. In her desert travels she has discovered dead volcanoes, lava fields, and a 50-mile-long sand dune that produced her favorite object: a plastic bag of sand. “Often I will tell someone, ‘Let’s go out into the desert,’ and I can see they didn’t know I was that kind of person,” she said, laughing. But on March 21, 2013, she was with a longtime friend who knew Kincaid was exactly that kind of person and who likely didn’t blink when the writer climbed up one of the Mohave’s Dumont Dunes, and then slid all the way back down. “I see it every day, it’s next to my bust of Karl Marx,” said Kincaid of her plastic bag filled with sand, which includes a small note about where the sand came from and the date. 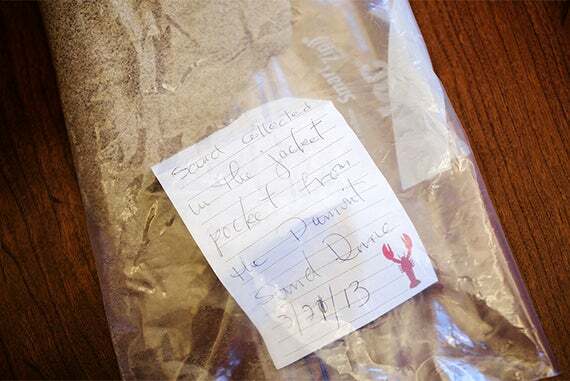 In the process, Kincaid’s coat pockets filled with sand. She discovered the stowaway grains back at home, and kept them as a memento. 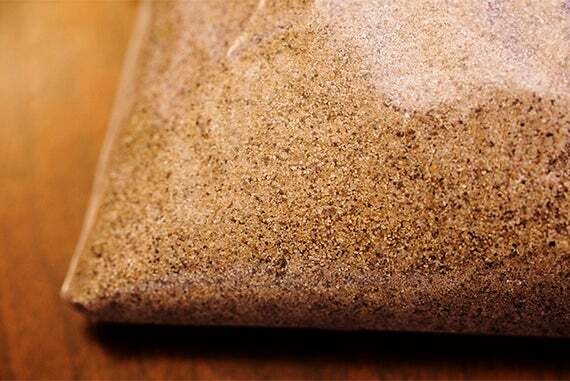 Today, the plastic bag, filled with multicolored sand, darkened by countless tiny black volcanic granules, sits on a shelf in her bright Barker Center office. “I see it every day; it’s next to my bust of Karl Marx,” said Kincaid, pointing to the bag that includes a small note about where the sand came from and the date. 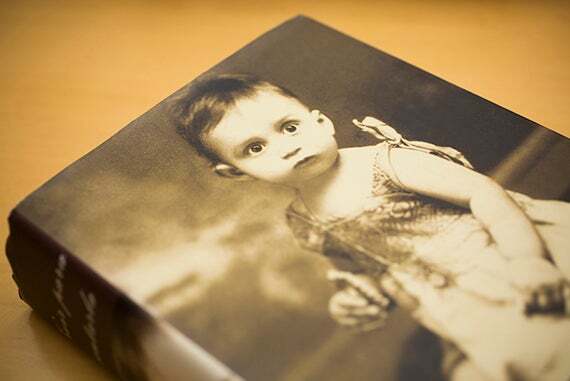 A shot of the cover of Davíd Carrasco’s favorite object, his copy of “Vivir para Contarla,” or “Living To Tell the Tale,” the autobiography of Gabriel García Márquez. 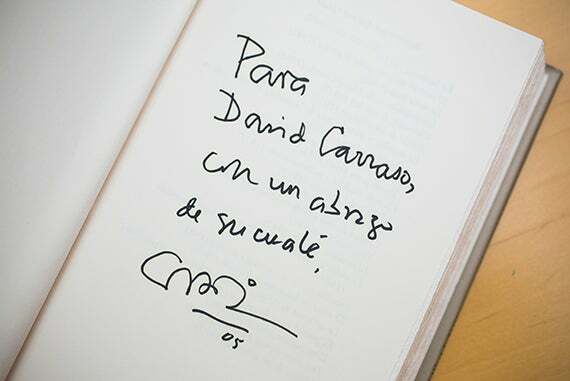 The Colombian author penned a personal note to Carrasco on an inside page. Davíd Carrasco’s favorite object links three literary giants: Carlos Fuentes, Gabriel García Márquez, and Toni Morrison. It also evokes his heritage. As such, he helped to jump-start a profound connection between two Nobel laureates. Davíd Carrasco, Neil L. Rudenstine Professor of the Study of Latin America at Harvard Divinity School. Carrasco and Morrison met at Princeton University and quickly became friends. In 1995 he invited her and her son Ford on a trip to Mexico City to explore some of the archaeological projects he’d been working on. She accepted, and asked if he could introduce her to García Márquez. A studied politeness between García Márquez and Morrison turned into a midnight hour of the Nobel Prize-winners trading stories and jokes and sharing their literary influences and inspirations with help from an interpreter. Morrison told Carrasco she treasured the evening as much as her trip to Stockholm to receive her Nobel. García Márquez later visited Morrison at Princeton and joined one of her seminars. “As time went on, observing them talk and visit together I had the feeling that he really developed a crush on her, it was clear,” said Carrasco. 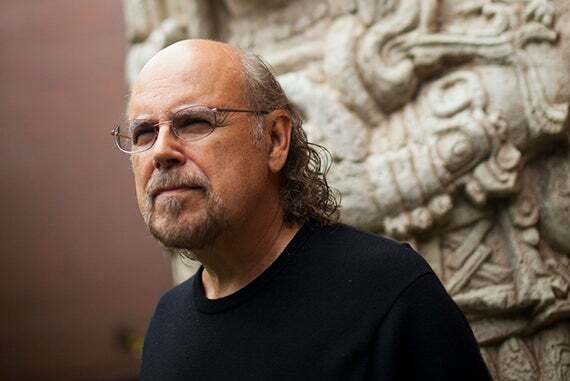 Carrasco helped to organize another meeting between the two writers in Mexico City in 2005. During lunch, each wrote a private message on a cloth napkin and gave it to the other as a gift. García Márquez also signed Carrasco’s copy of “Vivir para Contarla,” or “Living To Tell the Tale,” the Colombian author’s autobiography. Harvard applied physicist and electrical engineer Evelyn Hu uses a three-dimensional model of a gallium arsenide crystal called a “zinc-blende” structure to help her students imagine the world of charged particles that swirl in and around atoms. Applied physicist and electrical engineer Evelyn Hu, whose research explores light at the nanoscale level, bioinspired materials, and other areas that “demonstrate exceptional electronic and photonic behavior,” brings her object to class. 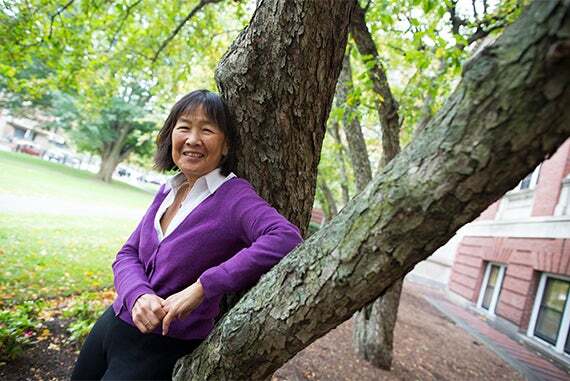 Evelyn Hu, Harvard’s Tarr-Coyne Professor of Applied Physics and of Electrical Engineering. Getting your mind around the type of tiny matter familiar to Hu can be tricky. So she regularly trots out a favorite visual aid for undergraduates. Her fall course has examined the fundamentals behind semiconductor devices, lasers, transistors, light-emitting diodes, and solar cells, and it requires “understanding how electrons live in a material,” said Hu. 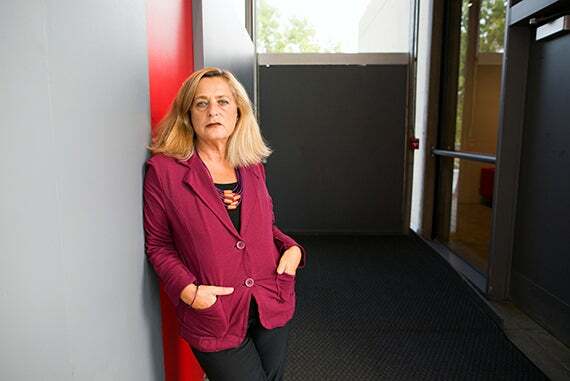 Her three-dimensional model of a gallium arsenide crystal called a “zinc-blende” structure helps her students to imagine the world of charged particles swirling in and around atoms, she said. 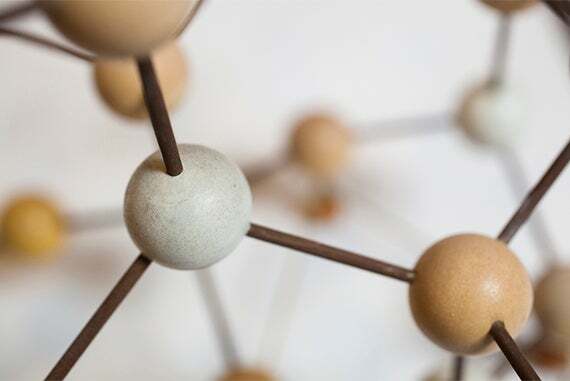 The roughly six-inch-high model consists of gallium and arsenide atoms represented by small, faded white and beige wooden balls that are connected by short, slightly rusted bars of metal, signifying electron bonds. Small, white and beige wooden balls represent the model’s gallium and arsenide atoms. Short rusted bars of metal signify electron bonds. She admits that many of her Harvard co-workers own fancier, more-sophisticated models, but she would never trade in her aging crystal. She loves its simplicity and its provenance. It originally belonged to her colleague Jim Mertz, a Harvard graduate, who recruited her to the University of California, Santa Barbara. 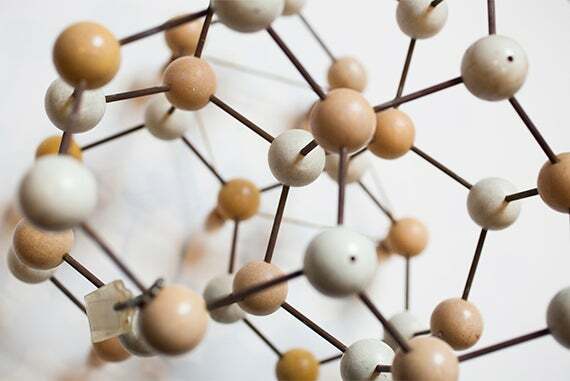 While there, they collaborated with colleagues from the electrical and chemical engineering and physics departments to develop an integrated program based on compound semiconductors such as gallium arsenide. Donald Pfister’s favorite item is a handcrafted wooden bowl decorated, courtesy of Mother Nature, with various fungi invaders. It seems fitting that Harvard’s resident fungi specialist with a passion for trees should choose an object that combines both of these interests. 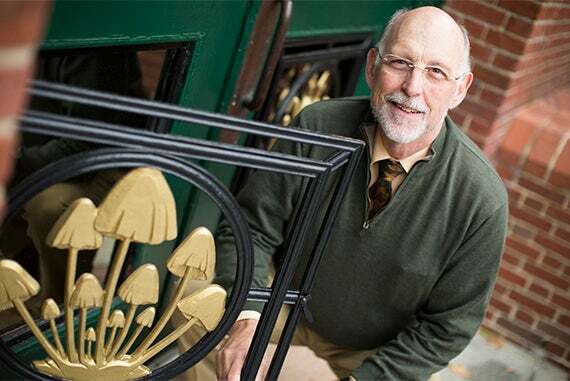 Donald Pfister’s favorite item is personal, but it has deep ties to his life’s work. On a rainy fall afternoon in the Harvard University Herbaria’s Farlow Reference Reading Room, Pfister, the Asa Gray Professor of Systematic Botany, showed off one of his more than 20 handcrafted wooden bowls. The design of this particular bowl, a gift from the Harvard College staff following his year as interim dean in 2014, involves an intricate pattern that almost resembles a landscape at sunrise or sunset. But what looks like the work of a talented painter is actually the work of one of the most talented artists of all: Mother Nature. 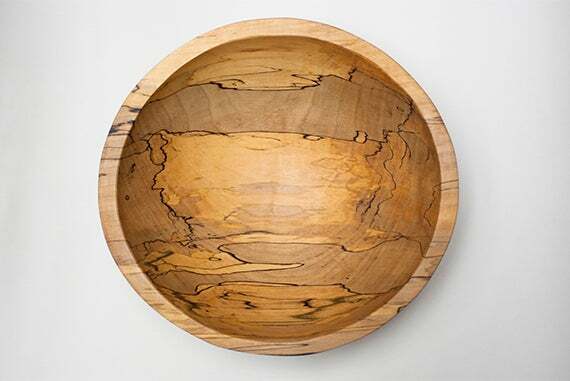 “This one is made from maple and it’s spalted, which means that it’s got this fungi growing through the wood,” said Pfister, pointing out the bowl’s elaborate markings. 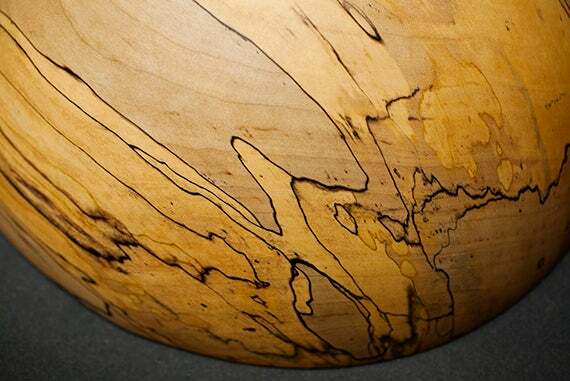 A close-up shot of Pfister’s favorite object, a maple bowl, reveals fungi growing through the wood. Fungi are often territorial, and when they invade a tree, they cut off the section of the wood they then monopolize “by laying down these tough lines,” explained Pfister, of the bowl’s ink-like marks. “And different fungi create different colors,” he added, noting the varying shades. Together they create dramatic patterns. The bowl has been part of a recent exhibit in the building on wooden items, and periodically it is used in class. “It’s an interesting kind of teaching tool for students to help them begin to think about the biology of fungi. Here’s this invasion of the wood … and the mechanism to compete and keep other fungi and other organisms out of that spot. Harvard’s Science Center was the starting point for HackHarvard. Sponsors of the hackathon joined the undergraduates at the event’s kickoff. The 479 students were vying not only for the $12,500 in prize money, but also a chance to solve real-world problems.